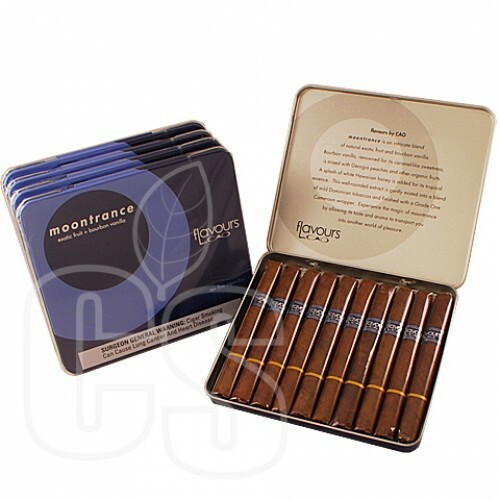 The “Flavours” line boasts an interesting collection of cigars, each delivering a distinct taste, hence the Flavours name. “Bella Vanilla” uses carefully selected vanilla beans from the island of Madagascar, infusing the sweet flavor with a blend of Cuban seed tobaccos. “Cherrybomb” bursts with a light creamy vanilla and citrusy palate. “Eileen’s Dream” stands out the most with a baffling range of hazelnut, coconut, white chocolate, mocha, and vanilla bean. “Gold Honey” is made with orange blossom honey that when blended with the tobacco, spawns a smooth citrus flavor. “Moontrance” is combination of natural exotic fruits and bourbon vanilla extracts which give off an almost caramel sweetness. Finally, there’s “Solfyre” which caters a sweet and spicy note that hints a little bit of cinnamon and whiskey.